There are errors in the shul newsletter and the shul website regarding this Shabbos’s times. I would list them, but they are too numerous. Please follow the times listed below. We apologize for the confusion. Mazel Tov to Benyomin Seltzer on his becoming a Bar Mitzvah . Mazel Tov to Hillel and Zahava Seltzer and the entire Seltzer and Adler families. Hillel and Zahava invite everyone to a Kiddush Luncheon after davening in honor of the Bar Mitzvah. Shalosh Seudos is sponsored by Alex Adelman in memory of his wife Blanche. This week we will speak about the “Avnei Neizer”. Deena’s Monday Morning Class for women has just begun a new topic: A lively and educational discussion on the Shmoneh Esrei. 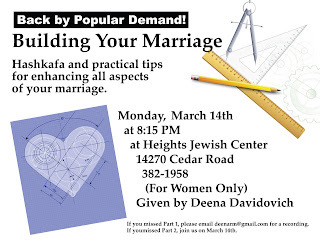 The class meets on Monday at 9:30am at the home of Rivka Romanoff,3791 Severn in Cleveland Heights. 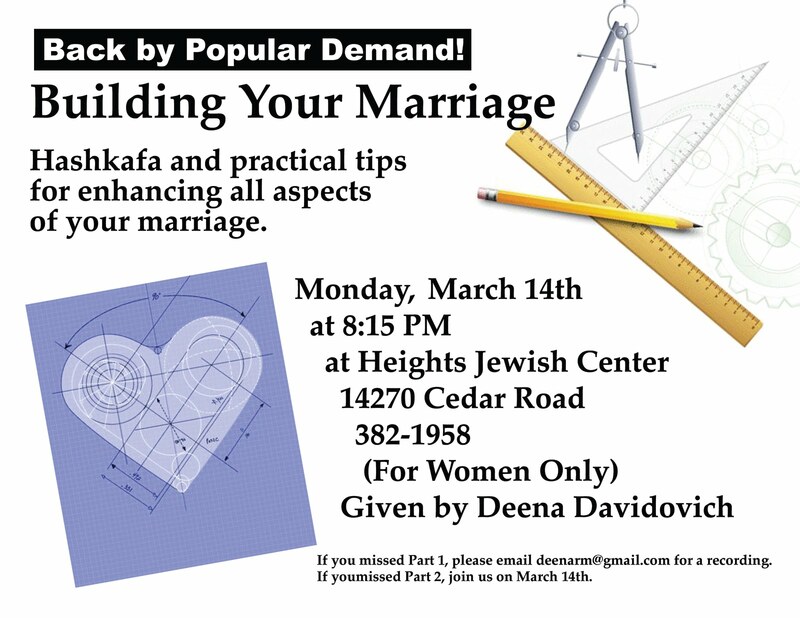 In response to numerous requests, Deena will be giving Part II of her Building your Marriage Class again this Monday, March 14 at 8:15pm. All married women are invited and encouraged to attend, to hear it for the the first or for the second time. There will be no recording available, so here’s your chance if you missed it the first time. Taanis Esther is on Thursday. The Shul will have a Purim Brunch on Sunday March 20 at 11am, after the second Megillah reading. Please contact the office to make your reservations. Remember to order your Purim Cards by contacting the office.